☂ Get Antichose's first collection of ephemeral and artistic tattoos in world exclusivity: a board of fourteen models designed by seven talented French artists is waiting for you. 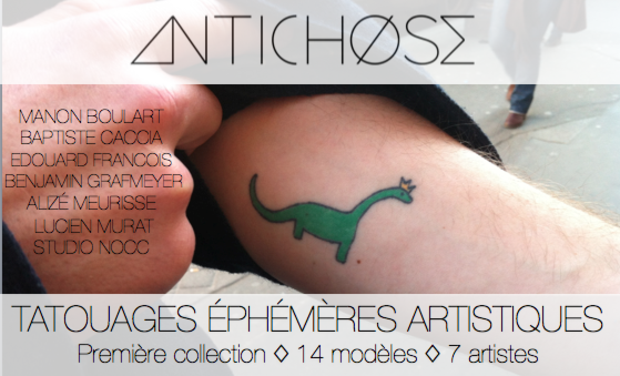 ☞ Antichose's first collection of ephemeral artistic tattoos is composed of fourteen models designed by seven talented French artists. Become a Patron of this new form of art! By funding this project, you allow the printing of this first collection. To thank you, we will send you a board of the fourteen first designs, in world exclusivity (no shops will be allowed to sell them for a month after you received them) and for a preferencial price (the amount of your donation will be less than the price of the board when sold). ✓ The tattoos will be of the best possible quality, so that the designs look as good on your skin as they would look in an Art Gallery. ✓ The tattoos are good even for sensitive skin - they respect the strongest quality standards and won't irritate your skin. ✓ The tattoos will stay on your skin between 3 and 8 days (depending on what type of clothes you're wearing but not on how often you shower, tattoos are OK with shower)! The collected amount will be used to fund the printing of the boards! ☑ Patrons will receive their board(s), and if they're in Paris they'll be invited to celebrate the launch of the first collection with us at a cool cocktail party. 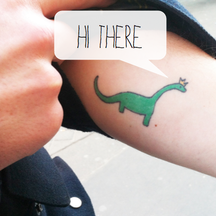 All patrons can send us the pictures of the tattoos they'll be wearing, and we'll compile them online in The Everywhere Gallery. ☑ The shops we picked to distribute the collection will then be allowed to sell the boards. ☑ Antichose will keep on working in the next collections... three are already in progress, with very talented artists! A new collection will be presented every three months. ♡ You're a fantastic person! If you're around Paris, come get a drink with us at the Launch Party to celebrate. ♡ You get ONE BOARD with the fourteen models of the first collection on it. And you're invited to the Paris Party if you want to. ♡ You get TWO BOARDS with the fourteen models of the first collection on it. And you're invited to the Paris Party if you want to. ♡ You get THREE BOARDS with the fourteen models of the first collection on it. And you're invited to the Paris Party if you want to. ♡ You get FOUR BOARDS with the fourteen models of the first collection on it. And you're invited to the Paris Party if you want to. ♡ You get FIVE BOARDS with the fourteen models of the first collection on it. And you're invited to the Paris Party if you want to. ♡ You get FIVE BOARDS with the fourteen models of the first collection on it. ♡ You also get AN ANTICHOSE TEE SHIRT with one of the models from the collection printed on it. And you're invited to the Paris Party if you want to. ♡ You get TEN BOARDS with the fourteen models of the first collection on it. ♡ You also get AN ANTICHOSE TEE SHIRT with one of the models from the collection printed on it. And you're invited to the Paris Party if you want to. ♡ You get FIFTEEN BOARDS with the fourteen models of the first collection on it. ♡ You also get AN ANTICHOSE TEE SHIRT with one of the models from the collection printed on it. And you're invited to the Paris Party if you want to.